Basketball fans brought up on the intense rivalries of the '80s and earlier commonly complain that today's NBA players just get along too well. While I and others would posit that people getting along is not really a bad thing, the observation itself is mostly accurate. Many of these athletes have been peers and competitors since their days in grade school, and rampant player movement means that many were teammates in past seasons. It's the new way of things. Nevertheless, proponents of the old ways will be happy to know that certain barriers to inter-team camaraderie still exist. 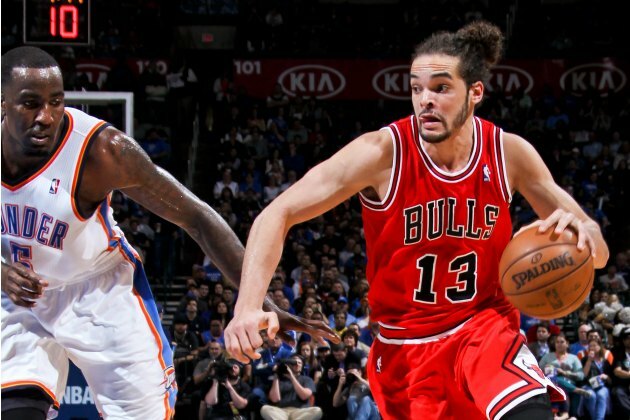 On Thursday night, after his Chicago Bulls fell to the Oklahoma City Thunder 107-95 at Chesapeake Energy Arena, center Joakim Noah decided to visit the OKC locker room to see former Bulls teammate Thabo Sefolosha, with whom he played from Noah's rookie season of 2007-08 to the day Sefolosha was traded to the Thunder in February 2009. Joakim Noah just came in OKC's locker room hanging out with Thabo and Perk didn't like it. "We just let anyone in the locker room now?" The exchange between Perk and Noah was really brief. It was kind of tense, but it didn't escalate to anything. Noah left when asked. It appears as if nothing happened beyond a verbal disagreement, and Noah seems to have understood that he wasn't wanted by most members of the Thunder and eventually left without putting up much of a fight. Although Sefolosha and Noah likely weren't making much of a ruckus, the Thunder are a team with certain rules and regulations. If most everyone but Thabo found issue with the matter, then chances are he made a mistake, however minor it may have been. The Thunder and Bulls don't play again until March 17 in Chicago, so chances are nothing will come of this story until then, if at all. To be safe, Noah and Sefolosha should probably plan their hangout sessions so that it doesn't interfere with the game. Perk gives really effective disapproving stares.